Sensibly Priced Studio in High End Complex, Best Center of Town Location! This comfy, quiet 1st floor studio condo, known as "The Lillian Hellman” at Gabriel's Condominiums, has Pergo flooring, a fully equipped eat-in kitchenette, a bath with shower stall, and a queen Tempur-Pedic bed in the main living/sleeping area. Other highlights include a gas fireplace, AC, ceiling fan, Free WiFi, and flat screen TV & DVD. This condo offers the best center of town location just behind Town Hall and adjacent to Monument Park. When you step into the grounds of the complex and you enter a beautiful, serene, garden hide-away. 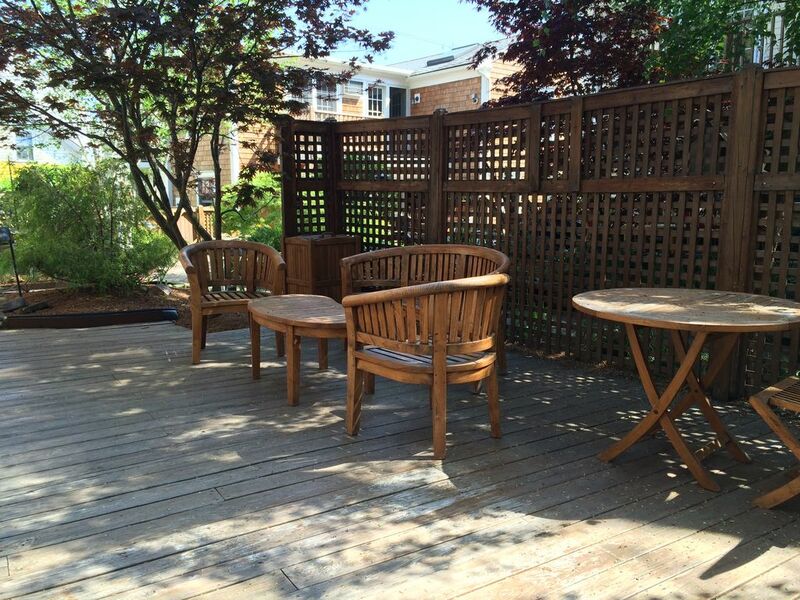 You enter this condo from a common area deck with gardens, plenty of outdoor seating and a gas grill. There is direct access to the park. Pets considered for an additional fee. Certain rules apply. Rentals during high season are weekly - Saturday to Saturday. Parking for 1 car is included nearby at the Monument Parking Lot from April 1 to October 31. No meters are in effect from November 1 through March 30. Please select "Ask Owner a Question" to send any questions you might have about renting this property. Please note, a new State & Local Room Occupancy Tax went into effect on January 1, 2019. This new law effects rentals beginning on July 1, 2019. The new law expands the state’s hotel and motel tax to include the short-term rental of homes (condominiums, single family, multifamily, etc.). Massachusetts is one of the last states to adopt this type of tax. These are the same taxes previously levied only on hotels, inns and guesthouses. Small, private bathroom with sink, toilet and shower stall. The unit is quiet and clean. The updated stove is so much better than the previous one, but know there aren't baking sheets or oven mitts so you may want to bring that if you plan on baking anything. We improvised with aluminum foil and the kitchen towel to bake something bacon one morning. I love that we can bring the dogs and spent time getting to know our neighbor's on the great courtyard at Gabriel's. Glenn is quick to respond and very accommodating. You cannot beat the location, free parking spot and of course the price! The unit was clean and well appointed in a great center of town location. Glenn was available to answer any questions we had. Great location. Not fancy but everything worked. Decent value. This was a perfect spot for a couple to stay! The studio was clean, had everything we needed, was affordable, close to everything, and the grounds were gorgeous!! Would definitely rent again!! My wife and I found this little gem while looking for a place to stay for a week during Carnival with our two small dogs. It's in a fantastic location and you can't beat the price, especially with an included parking spot for the week. It is located right next to the Pilgrim Monument Memorial Park which is a perfect place to take the dogs out. I read reviews about how tiny and dark the place was and I was a little nervous at first, but it was roomy than I expected and had lots of lighting everywhere with two windows so it didn't feel too dark. We, of course, packed way too much and had so many things but were able to organize in the space without difficulty, including a dog crate. The dog's adjusted well to the apartment and cozied right in. The bathroom is quite small, especially the shower but because we are shorter it worked fine for us for a week, but this did not surprise me as I had seen that in earlier reviews. I really liked that we could cook some meals to save some money too. Granted there are some updates this apt could use, but then you wouldn't get this fantastic price. Glenn, the property manager, was professional and responsive and even let us know when the apt was ready so we could check in a tad earlier. We are definitely coming back to this hidden find! We stayed in the smaller adjacent unit - Emily - during the week of July 4, 2015. Returned for July 4, 2016 and rented the larger Lillian Hellman unit. Both are managed by Glenn. His management style is straightforward and HONEST. We first found this condo complex after dealing with the manager of another complex who advertised one price and attempted to charge more after we booked. Lemonade from a lemon. Both of these units, Lillian and Emily, are clean and cute. Very quiet. Location is perfect. One block from epicenter of action on Commercial Street. Bas Relief Park is adjacent for quick dog walks. Outdoor courtyard is beautiful. The only concern you may have is the small size of the stand-up shower in Lillian. If you are very heavy it might be a tight fit. For us, no complaints. We'll be back. Location! Location! Location! Stay right in the heart of Provincetown! You will appreciate this more than you know! This condo is situated in the very center of Provincetown on Bradford St behind the Town Hall and directly adjacent to the historic Bas-Relief Monument Park, which is at the base of the monument. It is an ideal spot offering the best of both worlds: You are steps to restaurants, bars, shopping, entertainment and the ocean, yet, wander off Bradford St into the complex, and you enter a secret, peaceful and quiet garden hide-away. Rates displayed are for 1 or 2 adults. Rentals during high season are weekly - Saturday to Saturday. Different rates may apply for holidays and theme weeks. Pets considered for an additional fee. Please inquire for a quote.